Mexico lent a helping hand to last week’s Canadian Music Week celebrations in Toronto. The Mexico Tourism Board and Aeromexico together held a Friday event that featured rock music, saying they were glad to be part of the festivities. “We are very pleased to be here. It’s a fantastic opportunity,” said Cesar Mendoza, who head’s the tourism board’s Toronto office. 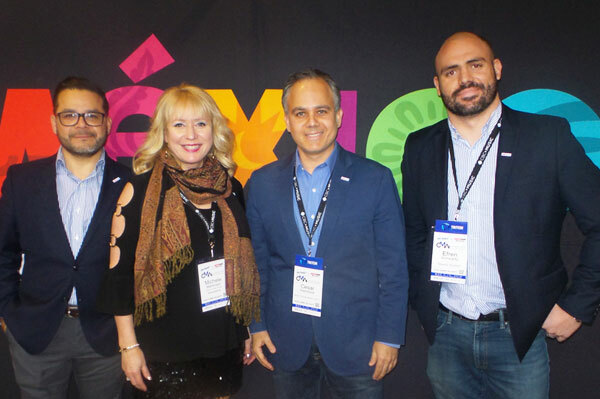 Pictured are Cesar Alvarenga and Michele Martinson of Aeromexico; Mendoza; and Efren Scharwz of the Mexico Tourism Board.